The OSG has been gifted several paintings, generously given by the artists Ms. Ann Shelley-Lloyd and Ms Doreen Jones. One of the paintings, given by Ms Jones, is currently used as the John Dillwyn Llewelyn Trophy for the ‘Best in Show’ at the OSG Orchid Festival, held in September each year. They were subsequently framed and currently adorn the board-room of NBG Wales. An article about Miss Ann Shelley-Lloyd can be found here. Here are two watercolour paintings kindly donated to the OSG by the North Wales artist Doreen Jones. The picture of the Paphiopedilum hybrid was incomplete when photographed and so the finished article shows a developing bud also. 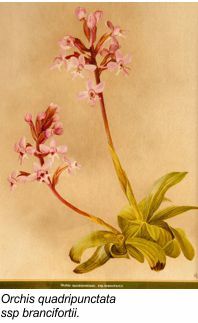 Each year, the name of the winner of the John Dillwyn Llewelyn trophy for best orchid exhibited at the Welsh Orchid Festival is added to a plaque attached to the base of the painting.